If these FAQs do not address your question, please contact us. See contact information. QUESTION: Are two fundamental sessions the same? ANSWER: Yes, two sessions are identical sessions. QUESTION: Do you have the Advanced Session? ANSWER: No, we don’t offer the advanced session this year. QUESTION: Where can I download a brochure? QUESTION: Where can I download a flyer? QUESTION: Where can I download a tentative camp program schedule? QUESTION: For the purpose of earning credit at the High School, how many hours of instructional time are there (i.e. time on non-leisure activities) for the program? ANSWER: There are 27 hours of instruction programmed for each session (week). QUESTION: Do you ever meet with students before hand so that you can see if this program is a good fit? ANSWER: We can meet and have met students by appointment. If you are interested, please see the contact above. 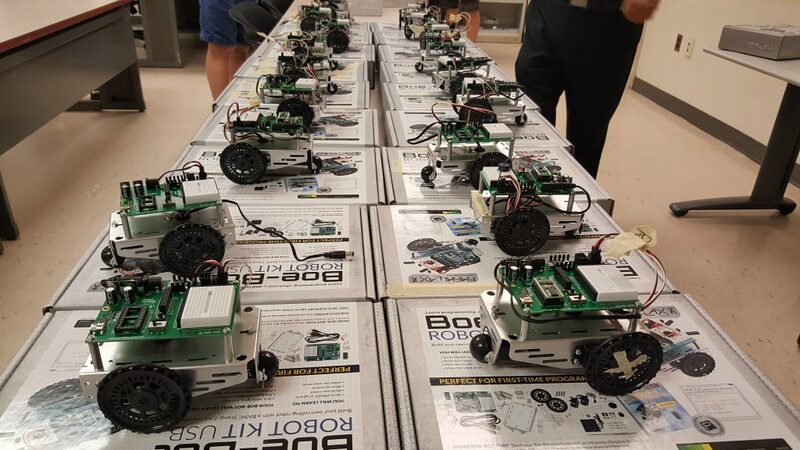 QUESTION: What robotic kits and programming language do students use for this summer program? ANSWER: We use the Parallax BOE-BOT. This robotics kit uses a language called PBASIC. QUESTION: The web site indicates that the student must be in the top 30% of their class. What type of documentation is required for that requirement? Is there a specific form that needs to be filled out? ANSWER: Normally the guidance office can tell students their ranking. But this is just a guideline. We evaluate the students according to the transcript that they send in as part of their application file. The form that needs to be filled is the application with us. Then you will need to pay for the application fee. After that, you will ask the school to send us a transcript, and also send the recommendation letter. QUESTION: Is the program suitable for someone that already has some experience? ANSWER: Yes our camp focuses on programming, and it is very appropriate and step up from a programming perspective from activities like FIRST and NXT programming. QUESTION: Approximately what percentage of the week is devoted to programming? ANSWER: In our program, about 80% of it is programming. QUESTION: What do I have to do on the RECOMMENDER part of the application? ANSWER: In the recommender’s section, you need to put the information for someone who will write a letter of recommendation for you. You will see more instructions on the recommendation and payment, once you submit the form. The recommender should be a teacher or a guidance counselor. QUESTION: How much will I learn attending the one week long camp? ANSWER: Overall, the camp focuses on electronics and programming, although there are necessarily some mechanical aspects. The camp focuses on motion guided by decision making derived from sensory inputs and control via wireless communications and computer vision. If you are not familiar with these topics, we are sure you will enjoy the camp, not only because of the technical content, but because of the college-like experience, and the teaming and competition aspects of the camp. QUESTION: What are considered College Prep Math courses? ANSWER: Any High School level Math courses taken by students planning to go to college are considered College Prep Math courses.